The plan is efficient, almost square, measuring 10 x 11m. Along the west of the ground floor is a garage finished in black panels of timber composite, extended by a canopy. Free and open, it is organised around a central core that contains the services: cellar, networks, shower/bath room, and kitchen. All the rooms form a ring around this hub. Uninterrupted through views and continual contact with nature are maintained by using sliding partitions and large glazed areas facing each other. A strip of ancillary and storage areas runs along the full height of the west wall. The overall scheme creates a multipurpose space, open onto the south and north gardens and the patios. Consistency is created between the building and the external spaces, which enhance each other. Thus the living area becomes larger than the space delimited by the walls. The house faces due south. Largely glazed, it benefits from solar gain, while being protected by brise-soleil adjustable louver sun breaks to control stronger sunshine in the summer, spring and autumn. Open onto the south and east, its upper floor is closed on the north, and the west side only has small openings for the showers and bathrooms. Since the local climate is strongly contrasted, with peaks of heat and cold, this plan layout allows maximum occupation of the patios according to the seasons, sheltered from the wind. In the long term, a variety of intermediate and peripheral elements may enhance the existing and vary the spaces, according to the weather and the seasons, such as arbours, canopies, pergolas, etc. On the upper floor, the system is reversed: the layout organisation starts from the core and opens onto the bedrooms. Following the principle of separation of daytime and night-time areas, the upper floor is occupied by four bedrooms and two bathrooms. The bedrooms face south and east, while the bathrooms open to the west. In addition to the clearly-identified living areas, the house has intermediate and multipurpose spaces. This is the case on the ground floor, which, with its sliding partitions, can have several layouts; also, some rooms that are not set aside for any specific purpose can be reconfigured according to the time of day, e.g., study-laundry-computer room or guest bedroom-study-music room. This adaptability is a response to the need to manage both privacy and communal life within the family home. The construction is simple. It is a timber-framed house, erected on a concrete slab, with a concrete topping laid on the upper floor. The structure is a prefabricated modular system. The roof insulation consists of 40 cm thick expanded cellulose wadding, and the wall insulation consists of mineral wool with woodwool on the outside, giving a total thickness of 32 cm. The woodwool slows down warming and cooling of the house by a lagging effect. On the facades, perforated larch cladding is fixed to double 5 x 5 cm wall plates to further increase the ventilation effect. The cladding gradually greys naturally, without any treatment, with uniform silvery tinges. Inside, a lining of knot-free, light-coloured polar panels is used with great uniformity for built-in cupboards, furniture and storage elements. Elsewhere, white plasterboard adds to the soft, brightly-lit atmosphere of the house. Space heating is mainly provided by floor heating on the ground floor and the upper floor. It is supplied by a condensation gas boiler and solar panels. The double-flow ventilation system is connected to a glycolated ground-air heat exchanger laid at a depth of between 2.00 and 2.50 m to the north of the house, which supplies air at a constant temperature of 12°C. When necessary, the exchanger can provide additional ventilation at night. During cold peaks, wood-burning stove covers additional heating needs, calculated for the overall volume and instantaneously, particularly for the upper floor. Waxed concrete and floor heating provide very pleasant thermal comfort. 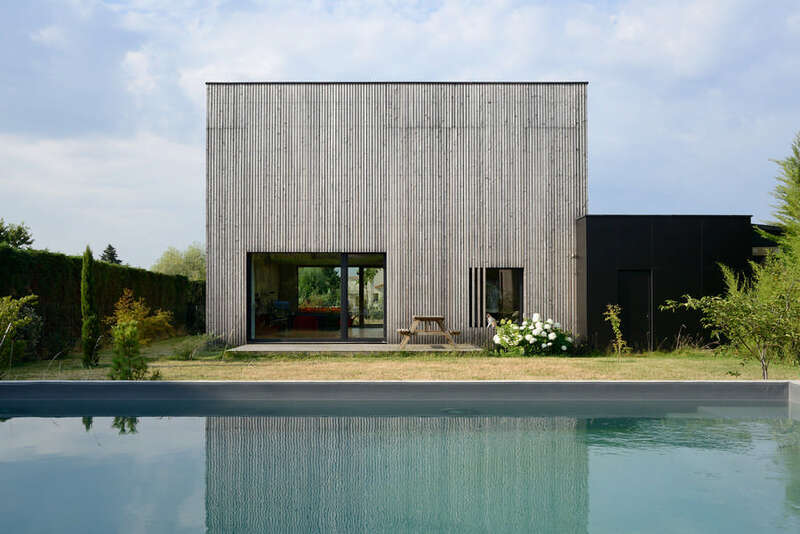 The concrete topping, which is chosen despite the timber structure, provides uniformity of floors on the ground floor and upper floor, in bedrooms, showers and bath rooms. In addition, the roof is planted with a sedum [stonecrap] covering, and rainwater is collected in an underground tank. Structure: Concrete ground slab. Walls, floor, timber framework roof structure in spruce. Secondary structure: Anhydrite topping dyed with finish resin. External walls: Larch small tiles, perforated timber cladding. Trespa Méteon bakelized wood fibre cladding panels. Structural panels: OSB by Kronofrance. Aluminium vapour barrier by Delta Reflex. Insulation panels: Isoconfort Isover glass wool panels on walls, and Isoroof Natur Pavatex wood fibre panels on roof. Roof: Cellisol expanded cellulose wadding. Bottom insulating layer: sprayed polyurethane foam. Roof: FPO Sika Sarnafil damp-proof membrane. Sopranature Toundra Soprema planted built-up roofing. External doors, windows & joinery: Mixed timber-aluminium by Bieber. Triple glazing. Lamisol adjustable louver sun breaks by Griesser. Heating: Rotex condensation gas boiler. Solar stratified hot water storage cylinder. Rotex Monopex heating floors. Wood-fired stove by Q-BIC Attika.